The laptop bag is made of finest quality genuine leather. The leather is soft to the touch and the zippers are well made with a metal zipper to make it easier to zip/unzip. This premium laptop bag is your fascination as crafted from well known premium designs. Your taste upgrades and charm prominent when you carry it with you everywhere. Super practical and easy to carry around, this multi-pocket backpack is a must-have for students, travelers. 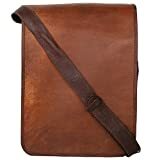 This is A World War II Series Vintage bag This Premium 100% Veg Tanned Full Grain Genuine leather laptop bag (Carry Laptop/Files/ 10 To 14 Inch). The bag measures 11 inches long, 4 inches wide & 15 inches in height (28 cm x 10 cm x 38 cm). Single zippered interior pockets to secure your items that they won’t fall out and two inner compartments along with special enough space for other acccessories along with side small exterior pocket. Take this bag to work and college to use for your laptop, notebooks, magazines, books, folders, cell phone, wallet, etc. The bag is not only of high quality, multi-functional but also durable and flexible. The Rustic Look In this bag makes it a perfect gift to give someone. It’s super sturdy and very comfortable you could use the inside compartment for your laptop as it will be secure in it, and the little hidden zipper inside pocket to keep coins and cards also having a zipper pocket on the side of the back you could use it to keep your small things. Presenting 15′ Inch Tall Amo Bag The World War II Series 100% Genuine Leather multipurpose laptop bag from the house Of IndiCraft Inc. A Replica Of The File Bag Used In World War, This Vintage Collection Is For The Urban Commuters, This Premium 100% Veg Tanned Full Grain Genuine leather laptop bag (Carry Laptop/Files/ 10 To 14 Inch)is great for office and college will be good for your work, life, entertainment classified items placed. The material feels most soft and skin-friendly It is a nice choice for meetings, short trip, keeping laptop with essentials. It also has a great slot for your tablet or laptop computer even with 2 notebooks and other essentials such as pen, papers, little bottles, hand sanitizer and stuffing in it that fits well. It’s super sturdy and very comfortable you could use the inside pocket for your clasp wallet and the little zipper inside to keep coins and cards. Featuring two internal compartments along with single protective and secure zipper pocket. Total two inner compartments & one zippered internal pockets with magnetic strap closure. Also having adjustable classic & graceful shoulder belt. Your taste upgrades and charm prominent when you carry it with you everywhere. Super practical and easy to carry around, this multi-pocket backpack is a must-have for students, travelers. An Additional Back Zipper For Your Bills. The modern design has plenty of organized storage, enough space for your cell phone, wallet and stationary with enough space left over. This entry was posted in Luggage and tagged 11inch, 15inch, Briefcase, Brown, Closure, Crafted, Designer, Full, Genuine, Grain, Handcrafted, Indicraft, Laptop, Leather, Long, Magnatic, Pattern, Plain/Solid, Tall by Perfect Vacation. Bookmark the permalink.